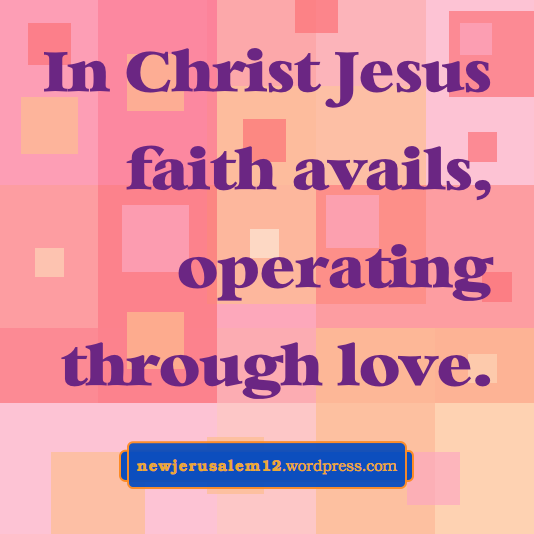 Faith and love supply us to pass through the sufferings that bring us to glory. This glory was first displayed in the Lord Jesus on the mountain and will ultimately be displayed through New Jerusalem. Here are more verses about faith and love for our journey to the city of glory. “Let us be sober, putting on the breastplate of faith and love and a helmet, the hope of salvation” (1 Thes. 5:8). Besides the suffering that comes to all humans, we are in a spiritual warfare. “The grace of our Lord superabounded with faith and love in Christ Jesus” (1 Tim. 1:14). Mercy (v. 13) and grace come to us from the Lord; faith and love return to the Lord from us. This is a spiritual traffic between the Lord and us. * This superabounding supply becomes our armor for the spiritual warfare. “Hold a pattern of the healthy words that you have heard from me, in the faith and love which are in Christ Jesus” (2 Tim. 1:13). This exhortation comes out of Paul’s suffering (v. 12) and his learning in spiritual warfare. The healthy words are those which supply eternal life to keep us spiritually healthy. When New Jerusalem comes down to earth, all spiritual warfare will have ended. But the spiritual traffic of mercy and grace, faith and love, will continue eternally. Let us not wait for that time. Lord Jesus, thank You for Your mercy and grace to supply me daily to return faith and love to You. In the New Testament are many verses about our growth and maturity. This is needed so that we will match New Jerusalem’s perfection. Struggle indicates a considerable effort. This shows both the importance of our maturity (to match New Jerusalem) and the non-trivial effort to reach maturity. 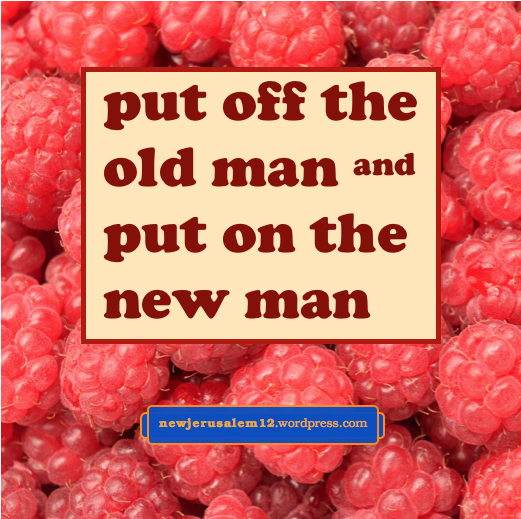 Epaphras copied Paul’s example, and struggled for the maturity of his fellows believers. Lord, grant us the willingness to struggle as Epaphras did. To struggle for maturity in this way is to struggle for New Jerusalem, which is the goal of the will of God, the goal of the bible, the goal of all the revelations in the Bible. This struggle for maturity is not in our own effort. Instead, like the praying of Epaphras, the struggle is by our cooperation with God so that He can move through us. 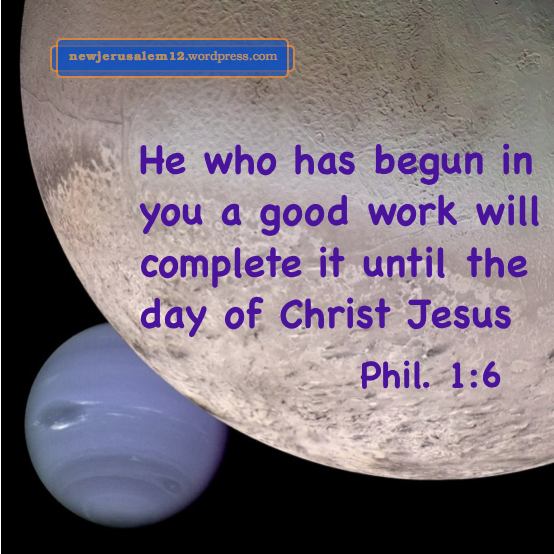 Our confidence is in God “Being confident of this very thing, that He who has begun in you a good work will complete it until the day of Christ Jesus” (Phil. 1:6). 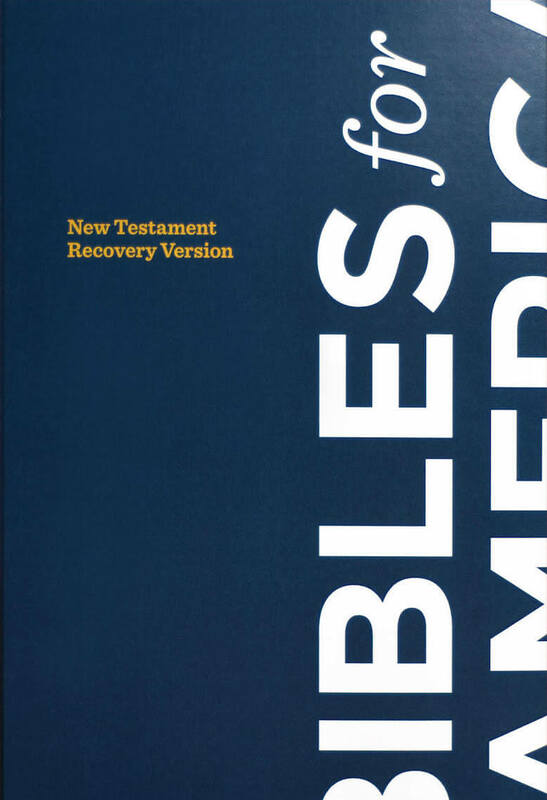 God began a good work in us by regeneration in response to our believing. God will complete the work to bring us to maturity and to New Jerusalem at a speed dependent on our cooperation. , based on the eternal redemption obtained by Jesus Christ. The city is part of God’s eternal covenant bringing us eternal salvation and an eternal inheritance. New Jerusalem is a city “having the glory of God” (Rev. 21:11). This is an eternal glory because God is eternal. “The God of all grace has called you into His eternal glory” (1 Peter 5:10). We are not worthy, but because of God’s mercy and the redemption accomplished by Jesus Christ, we have been called into the glory of New Jerusalem. 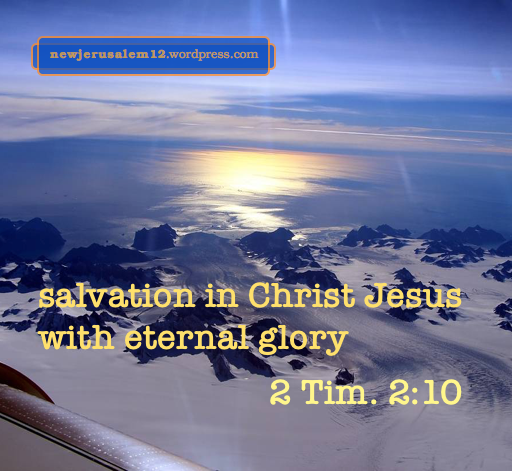 Second Timothy 2:10 also speaks of our obtaining “the salvation which is in Christ Jesus with eternal glory.” Although we have not physically seen this glory, we have been called into it and have obtained by faith. And by faith we hold to this salvation with glory. Do not be shaken by troubles now. Second Corinthians 4:17 says, “our momentary lightness of affliction works out for us, more and more surpassingly, an eternal weight of glory.” We have been called into eternal glory, and through afflictions the Lord constitutes this glory into us. As a result we correspond to New Jerusalem. The afflictions are also mentioned in 1 Peter 5:10. After the phrase quoted above, it says,”after you have suffered a little while, will Himself perfect, establish, strengthen, and ground you.” Our cooperation is to look away by faith to what is eternal: “we do not regard the things which are seen but the things which are not seen; for the things which are seen are temporary, but the things which are not seen are eternal” (2 Cor. 4:18). Through the Bible and the eternal Spirit, we can be strengthened with the view of the eternal glory of New Jerusalem. Photo by John Sonntag, courtesy of NASA. The riches of God‘s kindness, forbear-ance, long-suffering, assurance, grace, and glory are to us today and will fill and radiate from New Jerusalem. This “good news” is “the unsearchable riches of Christ as the gospel” (Eph. 3:8). We can all learn as Paul did (Phil. 4:12), “I know also how to be abased, and I know how to abound; in everything and in all things I have learned the secret both to be filled and to hunger, both to abound and to lack.” Whether we abound or are abased in human terms, the riches of Christ are available. Similarly to Paul, the Lord Jesus tells the believers in Smyrna (Rev. 2:9), “I know your tribulation and poverty (but you are rich).” They were humanly poor but divinely rich. In such circumstances, may we be “rich in faith” (James 2:5). This faith substantiates and carries us toward the presently unseen New Jerusalem. 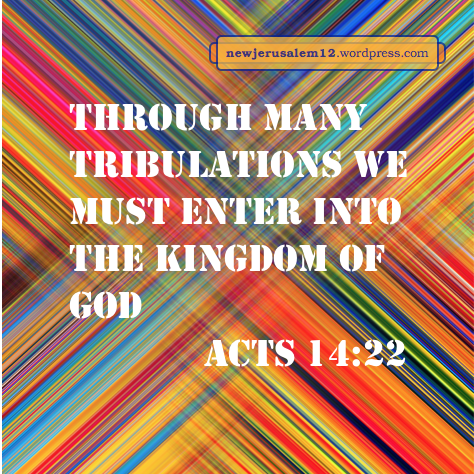 These riches will abound in New Jerusalem, but don’t wait. 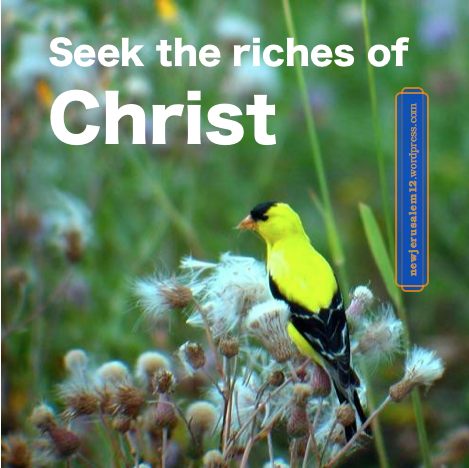 Consider two paths to being rich in Christ. One is Ephesians 3:14-19. Paul prayed that the Father grant us, according to the riches of His glory to be strengthened that Christ may make home in our hearts. (This strengthening is much higher than if it were according to our lack.) Father, grant me the strengthening I need for Your Son to make home in me! 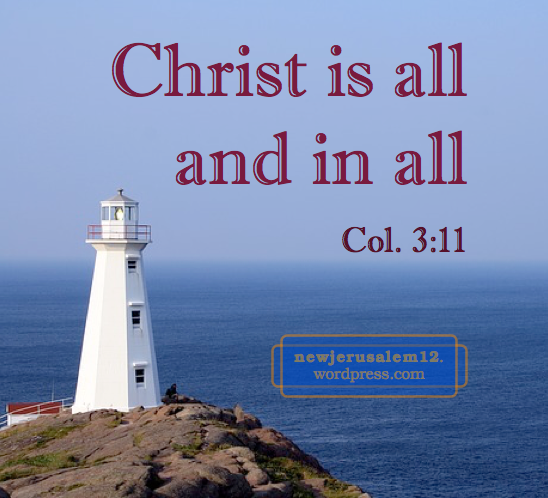 A second path is in Colossians 3:16, “Let the word of Christ dwell in you richly…” His words are spirit and life (John 6:63), so His words can live in us. Lord, cause Your word to live richly in me! “O the depth of the riches and wisdom and knowledge of God! How unsearchable are His judgments and untraceable His ways!” (Rom. 11:33 – sing it) Praise Him now; praise Him in New Jerusalem! Photo by Randy Roberts, courtesy of USDA Forest Service. Jesus Christ is the living Stone and we too are stones for God’s building today and for New Jerusalem. Genesis 2:7, “Jehovah God formed man with the dust of the ground…” In God’s creation we are earthen vessels but in His new creation by regeneration we become stones. God created Adam, using a piece of clay taken from the earth as material. Therefore, all of us today who have been born of Adam are also clay. However, since we have been saved with God’s life, in God’s eyes we are no longer clay but stones. Immediately after Simon Peter confessed that the Lord was the Christ, the Son of the living God, the Lord said to him, “You are Peter” (Matt. 16:16-18). Peter is a translated word which means “a stone.” Likewise, every saved person is a “Peter,” a stone, used by God for the building of this city. By this precious faith we lay hold of the precious promises. 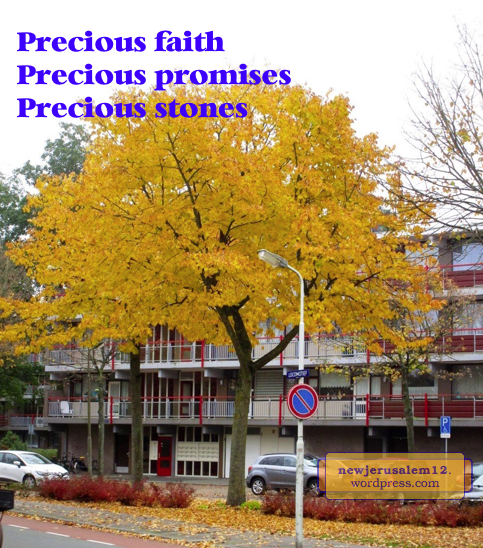 Through these promises God works in us to make us precious stones for His building now and for New Jerusalem. Lord, we are open to You. Work in us and constitute us with Your preciousness. 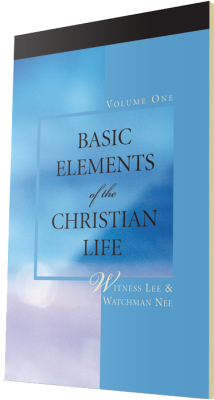 A short video by Christian Research Institute about Witness Lee. Jesus Christ died to redeem and purchase for God “men out of every tribe and tongue and people and nation” (Rev. 5:5-9). 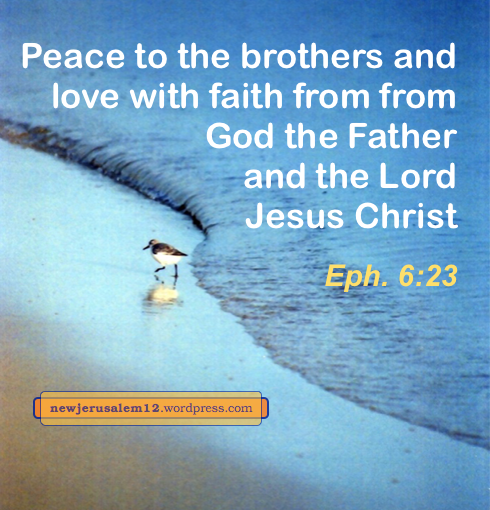 In His death He created “in Himself one new man” (Eph. 2:15). And, “in one Spirit we were all baptized into one Body, whether Jews or Greeks, whether slaves or free” (1 Cor. 12:13). Because of their absoluteness, Hebrews 11 continues “Therefore God is not ashamed of them, to be called their God, for He has prepared a city for them.” This city is New Jerusalem, where we will be with all of them. In our Christian life, may we enter fully into the absolute seeking of this “cloud of witnesses” (Heb. 12:1). Lord save us from any remembrance of the country (or race or social status or language) from which we came out. Lord save us from any opportunity to return, and keep us always seeking the better country. Lord, every day give us a longing for New Jerusalem. The Bible charges us to obey the government (1 Peter 2:13-14). Therefore we should obey distinctions which the government makes (e.g. citizen, non-citizen) but we should not bring these into our Christian life and our Christian fellowship.